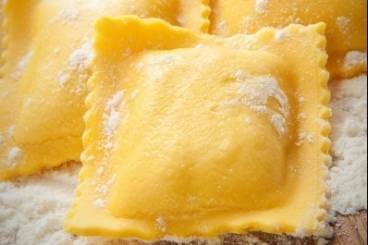 Ravioli are little pasta parcels stuffed with a filling of choice, for example with Italian ingredients such as different types of cheese, ham or seafood. Ravioli of foie gras served with white truffle and chicken jus. Ravioli made with fresh pasta and filled with crab, salmon and basil. Served with a tomato and butter sauce. Butternut squash roasted with garam masala, caraway seeds and thyme before being blended with goat's cheese. These delicious ravioli are served with crisp pancetta, sunflower seeds, lemon and red chilli. A sweet 'ravioli' of mango and mascarpone served with a chocolate sauce. An exquisite pasta dish made with butternust squash, complemented by a delicious butter sauce. Delicate sweet ravioli filled with pineapple cooked in caramel and served with a mint drizzle. Scallop ravioli with white truffle oil, mussels, cockles and poached fennel.